This dress is very good value, good quality!!! 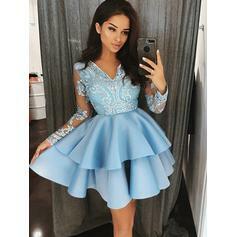 My daughter is in love with this beautiful dress. I was so impressed with the quality!! Not to mention how accommodating and nice they were to deal with. They were able to customize the dress for us to add some modesty, and still get it to us quickly and easily. Excellent communication! Thank you so much! We purchased this gorgeous dress for middle school prom. It was PERFECT! The quality was above and beyond what we expected for the price. I think it was a beautiful dress at a great price. When your child is attending multiple formal dances each year, who want's to pay $300-$400 per dress? Will definitely be looking at lalamira's dresses again for future occasions!